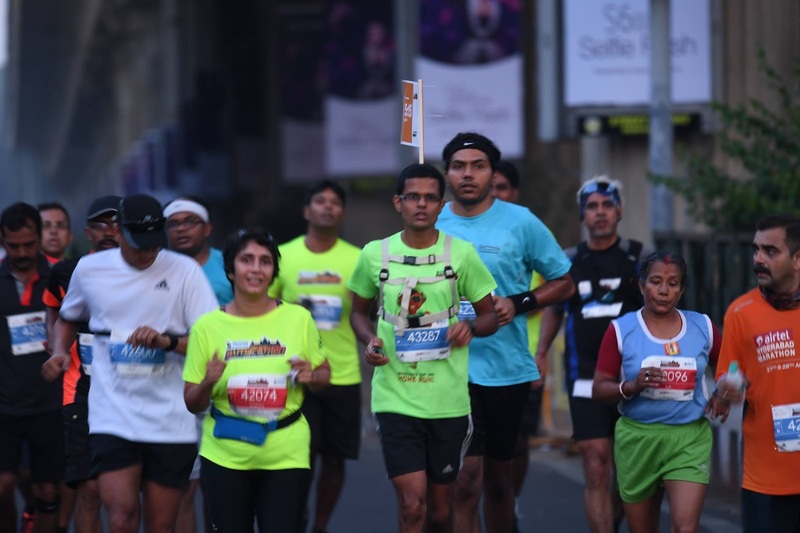 Bangalore runners, many of my friends and their Facebook walls get into this mad frenzy during the annual running festival – The Shriram Properties Bengaluru Marathon, every year. This time though, I had committed to doing the Malnad Ultra, just a week before. There was no way, I was celebrating this festival. The race director, Nagaraj Adiga, did not want me to miss out on the action. I volunteered to pace the slower runners. He let me pick, I choose the 5:15 bus. Pacing / Pacers are a common sight in large city marathons. The pacers have 2 objectives – 1. run at an even keel (or as per pre-published pace strategy) to finish +/-30secs from the time target and 2. Use experience to motivate runners to stick to pace and help them finish. Adidas, one of the sponsors, was kind to sponsor shoes, shorts and tee shirts for the pacers. We were given specially designed pacer pack to hold a flag (with the target timing) off our backs. I have seen pacers and used them as markers during my Singapore marathon way back in 2009. In those days, GPS was not as popular, many runners used the help of experienced pacers to finish in target times. Almost any runner has GPS, a watch or on a mobile. Most watches have virtual partner features, which is essentially a virtual pacer, doing a constant pace. So, what value does pacing bring to a runner. Almost as soon as I wore my pacer flag at the warm up area, I was approached by wannabe full marathon finishers. At the start about 5-10 of them stuck together and we started the bus. My plan was to stick to 7:30 pace all through. “Runeversations” happen mostly during the first half. I shared a few of my stories and tried to engage most runner in sharing theirs. There was a mix – mostly first timers, some well trained, some not at all, some afraid to go faster, others already too fast for their pace. Being the slow bus, I had many runners who were inadequately trained. During the Q&A that was going on, it was difficult to say the hard truth “Train hard, race easy”, without affecting the morale of the runners. During the later stages of the run (perhaps, when they need a pacer most), when some of them dropped pace, I could only egg them on, without slowing down my pace. I whish I could have slowed down, prodded them some more, and picked up pace. But alas, my pacer duties forced me to stick to my pace. The heaviest casualty for my bus was during the Indranagar 100ft road. After that undulating stretch, I was left with just a handful of runners. Then a couple of them wanted to speed up. So, by the time I got to about 32kms, I was looking for new recruits, except one. The course markings were off by about 500m, and I did some miscalculation at around the 36k mark, which got me running at a fast clip for a bit. This, however, helped me correct for the longer course. Once inside Cubbon Park, I egged along a few runners to pace along for a strong finish. I finished with the clock showing 5:14:49 or so, on target! It sure was a good experience and although I was running 3min/km slower than my marathon pace, it sure was tough. I am happy to have contributed in some way in the finish of a few fellow runners. For the first time, in over a decade, I completed a FM in over 5 hours! 1. Route - On the return, the stretch from 100ft road turn (on old madras road) till Trinity circle was not good. Traffic was not blocked, we had one thin lane to run, traffic is heavy, fuming buses, etc. You should avoid this, by considering returning via Old Airport road to Trinity circle and then left turn into MG Road. That way runners will not need to cross Trinity circle (both while going out from MG road and then coming back). 3. Aid stations - Much better than last year, where I did not find gatorade or electral for most of the run. This time electral was there for most part, except a few water stops towards the end. The bananas were not ripe. I loved the peanuts and chikkis. 4. Post run food - Bisibele bath was very spicy. Rava is not great on nutrition, Pongal and curd rice would have perhaps been better options.